Dr Dorjee Rapten Neshar, Chief Medical Officer of Men-Tsee-Khang Bangalore Branch clinic honors Anil Kumar (Left), Curator of Vaidyaratnam Ayurvedic Museum, Ollur, Trichur during the visit of Men-Tsee-Khang and Friends of Tibet representatives to the campus. Tharanath Menon, Friends of Tibet Campaigner next to them. "Take a journey in the surrounding countryside outside Takshashila for one hundred miles in every direction, and then return and show me something you found that was not medicinal." Jivaka travelled the countryside looking for something of no medicinal value but everything he encountered could be put to some use in healing. It was decided long back that we make a trip to the Vaidyaratnam Ayurvedic Museum, Ollur near Trichur and we were able to plan for the trip during WB48, a trip that will travel down the memory lane, a trip that took us through the Buddhist connection of Ayurveda. "WB48", the 48th Wellbeing Tibetan Medical Camp in Kerala is special in many ways. It's a year since we moved to the eco-friendly environs of CSPA at Sylviander House, Alappuzha. A year since we effectively put in practice our campaign "Say No To Plastic", it's a year since we adopted Organic Wellbeing — using only organic food and vegetables during the camp days. It was also special because a film on Tibetan Medicine, 'Legacy of Menla' premiered in Budapest, Hungary on January 28, 2016, the day WB48 started. The film featured Doctor Dorjee Rapten Neshar explaining about Tibetan Medicine and was filmed in Bangalore, Kochi (during Wellbeing Camp), Chennai and Dharamshala. The film featured experiences of people affected by Cancer and people who suffered from Cancer and how Tibetan Medicine had its effect on them. The film also featured poems penned by Eswar Anandan, Campaigner, Friends of Tibet. After the hectic schedule of the two day camp, we started early in the morning on January 30, 2016. 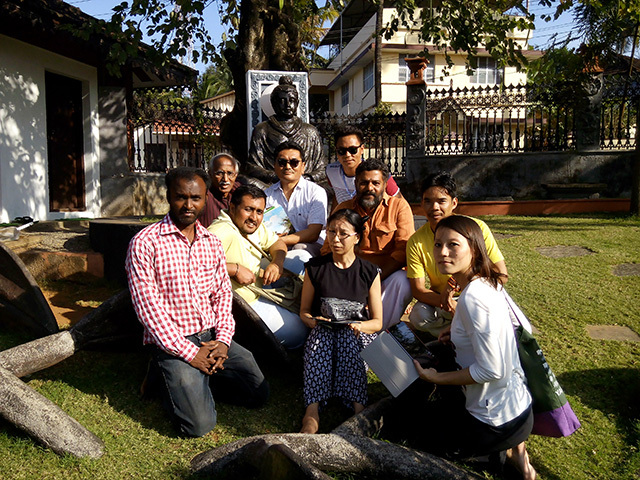 The team comprising of the Medical team from Bangalore: Doctor Dorjee Rapten Neshar, Chief Medical Officer, Men-Tsee-Khang, Bangalore; Doctor Lhundop Dorjee, Yeshi Choedon, Tenzin Nangsel and Tenzin Dhonden and Friends of Tibet Campaigner Eswar Anandan reached Thrissur Lakshmi Nature Cure and Ayurveda Clinic, greeted by AK Tharanath, Administrator of the clinic and a campaigner of Friends of Tibet. After a high tea, the group travelled to Vaidyaratnam Ayurvedic Museum. Anil Kumar, Curator of the Museum welcomed the gathering. The tour of the museum started with the story of the great masters of Ayurveda — Dhanvantari, Bharadwaja, Atreya, Jeevaka and Vagbhata. The team was then told about Nakshatra Vanam. As per the birth star of a child, one has to adopt a plant, an animal and a bird. The different plants associated with different Stars and the importance in terms of diseases, emotions attached to the same was explained later. The relevance of sacred grove or 'Kavu' was explained. Earlier days every household had a sacred grove or an area kept aside for nature, where trees grew into a mini-forest and was not 'controlled' by cultivating. This sacred grove acted as an oxygen cylinder for the house hold. This is a long forgotten practise and now belief has overtaken purpose. Another interesting information was about the much used 'punishment' in schools in earlier days — Thoppukaranam or Dvau Bhuja Karanam, which a lazy or inattentive student is made to do. It has now evolved and being practised in the West as Super Brain Yoga! The science behind Dvau Bhuja Karanam was explained to the visiting team. The well in the eastern side in front of the 'Guru Griham' was prominent. Anil explained the tradition of constructing a well in the eastern side in front of traditional houses and the relevance of usage of pulley instead of modern day electric motor. He explained the health benefits and how the dramatic increase in the number of thyroid related issues amongst people of the state in the last decade or so finds its roots in this change in culture. The team was then shown the various plants which resemble body organs and its purpose and how each of this plant work as a medicine/supplement for the related body organ was explained. This was often described as "Theory or Doctrine of Signatures", something the practitioners of modern medicine always ridiculed as it lacked 'scientific evidence'. The team then proceeded to the well-equipped theatre hall where a series of presentations on Ayurveda was screened. The next 2 hours was spent watching in awe the treasure house of knowledge about nature, Ayurveda and the genius of our past which is now slowly fading and evolving in research format in the west, with the western world patenting common and day to day knowledge of the past in India. Representatives of Men-Tsee-Khang, Tibetan Medical and Astrological Institute of HH the Dalai Lama and Friends of Tibet at Vaidyaratnam Ayurvedic Museum, Ollur, Trichur during their visit on January 30, 2016. The presentation stressed the importance of getting close to nature and how the nexus between junk food and pharmaceutical companies are creating a plethora of diseases and medication for the same. How major hospitals are using unwary poor patients to test new medicines and how they are being used as human guinea pigs unaware. There was an interesting presentation on Ayurvedic clock and the almost forgotten Indian toilet sitting posture and how the change has brought about increase in occurrence of Colon and urinary related diseases including Piles and Colon Cancer. Interestingly now it's being scientifically studied and a western company has come out with a product which almost recreates the posture and is now sold in Indian market at a cost of INR 2125, a posture which was natural as long as human beings existed! There was a discussion on how applying oil on head helps one keep away from diseases. Traditional dental care 'umikari' Rice husks powdered and mixed with peppercorns, Borneo-camphor, used widely for generations but replaced with modern tooth paste which came out with an advertising campaign against the age old practise! But like the wheel of life turns, the same company has come out with benefits of charcoal dental products! Videos showing research done on the health benefits of the 'smart ash' was screened. The team was taken through the artistically created museum where history is re-created using life size model and environment taking us on a tour about the evolution of Ayurveda to the modern day. How years or research was done by sages who observed the plants that birds and animals used when they were sick and how these plants were studied in detail and texts written on the science. There was also a 3D studio which showcased the various plants, surgical tools that evolved from the shapes of beaks of birds (which is now being used in modern surgery), the various Ayurveda treatment plans and its benefit and usage. Chanting Tibetan prayers, the Tibetan Team paid obeisance to the statue of Buddha. Notable was the sapling from Bodhgaya making hearts pour out emotions! Dr Dorjee Rapten Neshar, Chief Medical Officer, Men-Tsee-Khang, Bangalore honoured Anil Kumar, Curator of the Museum with 'Khata', a Tibetan Traditional Scarf. 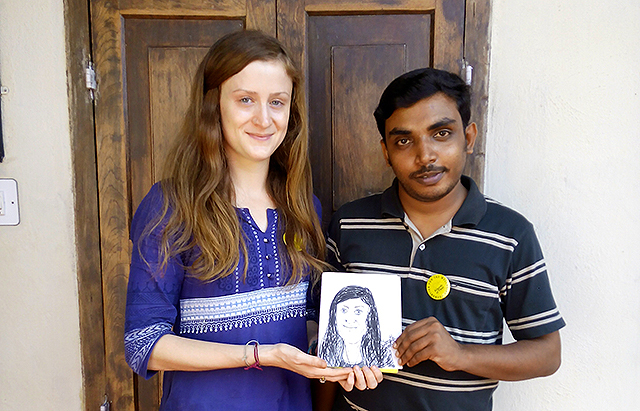 Caricaturist and Wellbeing Volunteer Sreejith Saseendran (Right) with a caricature of Victoria Sheldon, another Wellbeing Volunteer during the 48th Wellbeing Tibetan Medical Camp held at Centre for Social & Political Art (CSPA), Sylviander House, Alappuzha, Kerala from January 28-29, 2016.